Your Twin Flame is not a person, it is the other half of your soul in higher dimension. It is the Fire of the Love of your Soul. You can re-unite with this aspect to help complete and heal yourself. The lower dimensional physical body will be affected and change. The people who embody the Twins, can meet at some point too, if they are mature, complete within. Some Twin Flames are not in the same dimension, but can meet in dream state or meditation telepathically. It is not necessarily the romantic love relationship that so many think it is. Read more below. We all have another part of our soul called the Twin Flame. It is really you with same Light-sound codes, but it has learned other lessons after the separation into polarities, and on its own journey through the cosmos and earthly incarnations. Now many Human aspects of the Twins are meeting. It can be strange and sometimes scary to see another you looking at you. Many people have the conception that this is the ultimate relationship partner. It can be, but need not be. 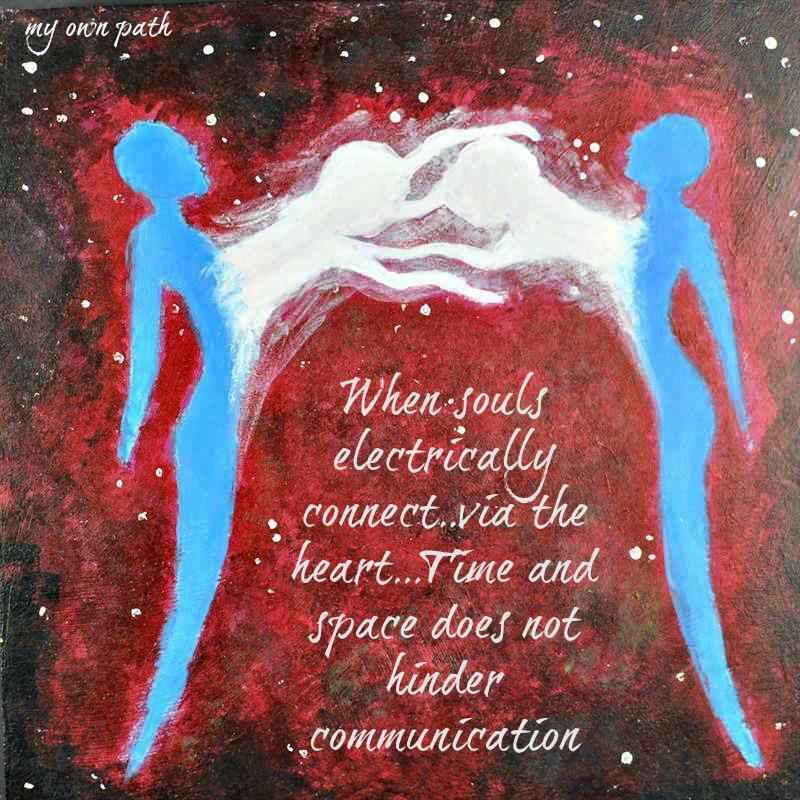 Your soul part and the Twin’s soul part longs to merge alchemically to unite as ONE HEART and feel complete. It’s not about being a couple, its about being whole again energetically as a LIGHT BEING. You and the other person with the second aspect of your soul will have many things in common. But each will also have opposite qualities and each need to develop some of the traits and gain some of the knowledge of the twin. The twin mirrors you. Twins usually have telepathic connection and can feel each other magnetically from afar. You may feel something for a while around you, without meeting the person. You may dream of someone that feels familiar. You probably feel your heart on fire when you see or sense the twin. So just surrender and allow love to attract your other half of your soul. You can call the twin in meditation by connecting a golden thread of light from your heart to the heart of the other daily and you may begin to feel the heart of the twin and or even hear the twin thinking. Once you meet in person, it could be difficult at first, as you both are so similar and may even look a like. It may take time to find a way to connect and relate. Some Twins are not in a body in the same dimension and the meetings can take place in dream state on another level of being. Energy exchanges happen between the soul parts and the physical person begins to change. The massive love that is between these two hearts, can even scare some and there may be a need for each person to heal some old wounds of the heart from their other relationships of the past. Once you have contact and communicate with each other, it is important to be honest and communicate each others feelings. Once you know each other better as friends and can love the other unconditionally, then you can feel what you and this other person can do with this grand love. You and your twin can be a couple, but not all do become this. You can also be friends or working partners, or you can meet and integrate each others information and go on your separate ways. It is more about the love that is ignited when the twins find each other. This love is so HUGE, that it heals all it touches. The love released, even helps the earth become a better and more joyful place, as so much love will conquer the darkness of negative consciousness. Stay open to all possibilities of creation. Some Twin Flames decide to do some service for humanity in form of teaching or creating something beautiful to lift their and the whole world. If you need assistance in form of advice, coaching, energy work for healing, see below. SHARING GUIDELINES: DO NOT COPY to your Blogs…reblogging is fine with my blog link and website. This may not be published in Magazines without my permission. classes and music – see on the website homepage more info. If you are not sure how to connect with your Twin Flame or need help understanding or have difficulty with a person you think is the person embodying your twin soul, you can receive assistance by booking a session with Kyria Alu’ela Priestess of Melchizedek, who understands the process well through her own experience. LOVE DONATIONS for this blog as a ONE TIME or MONTHLY support are greatly appreciated to help me continue the unconditional offerings to reach many on earth who may not be in a position to pay for classes or make donations. It will assist Kyria’s production of CDs of Sound Codes for Ascension & Healing, as well as for her other projects for the new children. One has to get over the idea, that Twin Flames are human partners too – the soul aspects are needing to be integrated not the person necessarily. My friend is happily married to a soul mate and her TF is a YOGI who she learned much from and he lives celebate and the 3 of them are all good friends. It is about the self-love that is released. If you are in pain, then you have not found yourself yet and do not love yourself enough. One does not lean on a TF. If the 2 people are a male and fem in bodies – some can work together or be a couple serving humanity – but it not a rule. Your TF is YOU. becoming energetically whole is the key and radiating the LOVE of CREATION to all. In the 5th or higher dimension, TFs that are ready, unite in the Time-space -continuum anyhow. Its about the self-love that is released. If you are in pain, then you have not found yourself yet and do not love yourself enough. One does not lean on a TF. If the 2 people are a male and fem in bodies – some can work together or be a couple serving humanity – but it not a rule. Your TF is YOU. becoming energetically whole is the key and radiating the LOVE of CREATION to all. Once in 5 D or another dimension TFs usually unite in the Time-space -continuum anyhow.